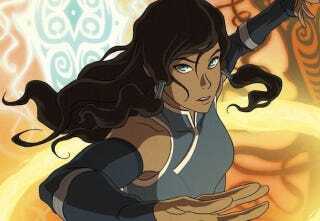 Holy Crap, Legend Of Korra: Book 3 Premieres Next Week! One week — that's all the time Nickelodeon is giving us now that they've announced the third season of The Legend of Korra, the excellent sequel to Avatar: The Last Airbender, will premiere on June 27th, Friday, at 7:00 pm. And with three new episodes! That's right, we're getting an hour and a half of new Korra next Friday, with episodes titled "A Breath of Fresh Air, "Birth of a Nation" and "The Earth Queen," respectively. Here's the first clip! "A Breath of Fresh Air": After the events of Harmonic Convergence, Avatar Korra discovers that her decision to leave the spirit portals open has unexpected consequences. Wild spirit vines have overgrown Republic City and Airbenders are suddenly popping up across the four nations. "Rebirth of a Nation": Korra, Tenzin and Team Avatar search for new Airbenders in an effort to recruit them and rebuild the Air Nation. Meanwhile, a band of sinister criminals are organizing to hunt down the Avatar themselves. I don't know what "The Earth Queen" is going to be about, but if it doesn't include an appearance by an ancient and incredibly cranky Toph, I'm going to be sorely disappointed.